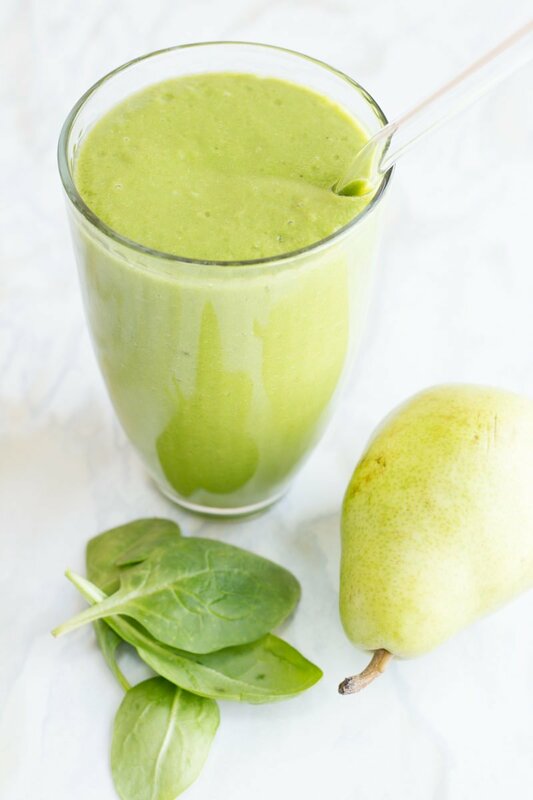 This Pear and Spinach Smoothie is sweetened using Medjool dates and bananas—no added sugar at all. It’s a great, healthy way to start off your morning! Have I told you guys that I’m off the juice? And by “the juice” I mean—dun, dun, dun—added sugar. My husband and I somewhat randomly decided one day a few weeks back that we were sick of being so totally obsessed with sugar. I truly believe that sweets can be a part of any healthy diet in moderation, but thanks to a quite decadent holiday season (ahem, I’m looking at you Christmas cookies), my body had become so addicted to sugar that I literally couldn’t sleep at night because I was fantasizing about eating cookies. I kid you not. That is not healthy. Sugar was no longer about treating myself, it had become something I needed. And I don’t like that. I’ve actually gone off of sugar to varying degrees a few times in the past, and it’s always been successful for me. 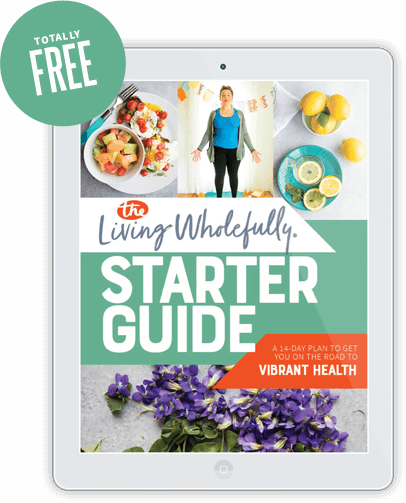 It’s helped me retrain my sweet tooth to appreciate little tastes of sweetness. And helped me remember how damn good a perfectly ripe piece of fruit is. 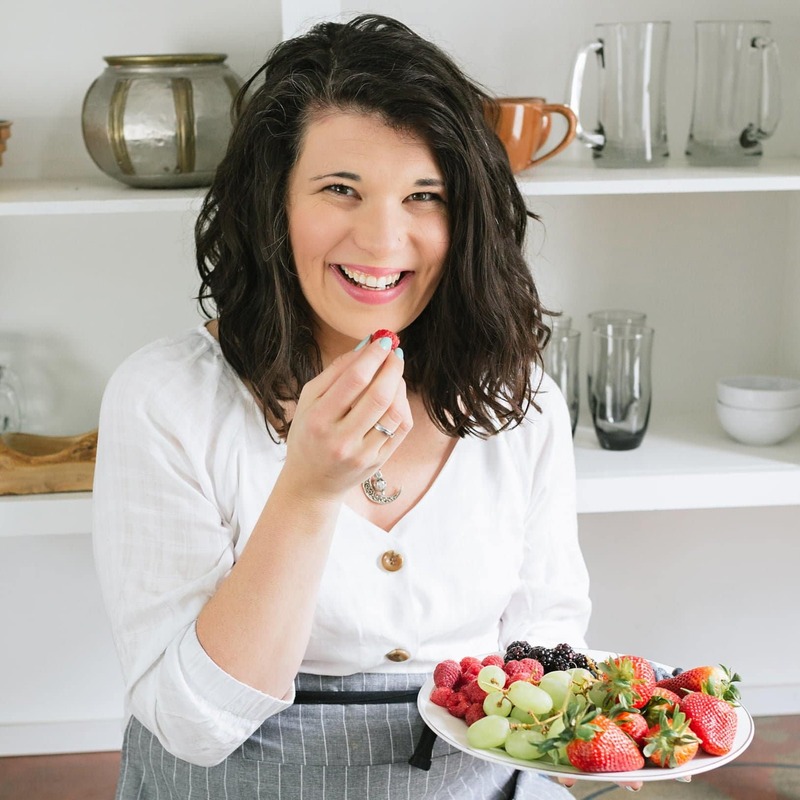 A couple of years back, I actually went completely off of sugar for a few months (no nothing), and while I found that to be very effective at retraining my tastebuds and body, it was a little extreme for my middle path personality. This time around, we’ve cut out most added sugar. We’re not being super strict about it. I’ve still been putting in a little bit of honey when I bake bread, and we are using natural fruit sweeteners (dates, bananas, applesauce), but overall, we’re in a much better sugar place. I am not reaching for the brown sugar, honey or maple syrup nearly as much as I did a few weeks ago. I knew this was going to happen from past sugar fasts of mine, but man, the first few days of sugar withdrawal were rough. I had a headache that wouldn’t quit, I was totally exhausted, and Craig will tell you that I was Ms. Crankypants. But once I got through those few days, I felt so much better! And it’s like I had a near instant switch in my tastebuds. Fruit tastes like candy now! In fact, sweets are almost (almost!) too rich for me to handle. Craig and I split some pie at my Dad’s birthday party last weekend, and while it was delicious, a couple bites was about all I could handle. If I would have been given that pie a month ago, I could have knocked back a whole piece (ahem, or two) without a second thought. Using fruit-based sweeteners has been a really interesting cooking experiment. If I was being super dedicated to this whole sugar-free lifestyle, I’d nix fruit sweeteners, too. But going completely sugar-free isn’t my end goal. 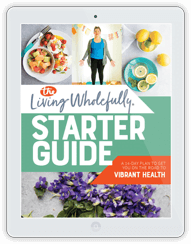 I’m just looking for some light behavior modification, and using fruit to help sweeten things still lets me have sweet tastes without throwing me off the wagon. Fruit-based sweeteners are like the nicotine patches of sugar withdrawal. Plus, I’m just having fun cooking with them! I baked a strawberry-banana quick bread and the only sweeteners were applesauce, mashed banana and strawberry puree. It wasn’t the dessert-y sweet banana bread your grandma made, but it was sweet enough to be delicious for breakfast. 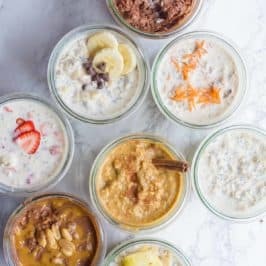 A little touch of unsweetened applesauce in my morning yogurt is all I need to make it sweet enough to be super yummy. 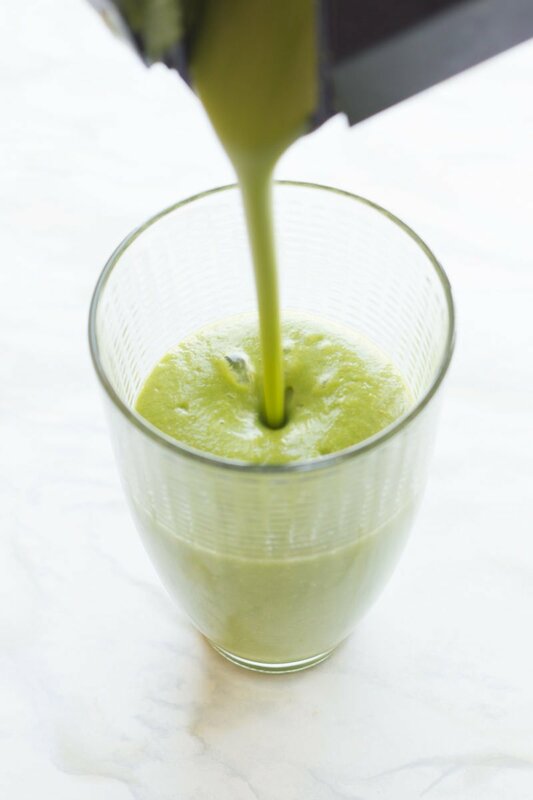 And I’ve been using soaked dates to sweeten green smoothies—and wow, it works so well! I’m slightly ashamed to admit that when I used to make a smoothie before, it was pretty sugar-heavy. As in, it wouldn’t be unusual for me to put banana, sweetened yogurt, sweetened almond milk, and some honey or maple syrup in there. Smoothies were much more dessert-like than the healthy breakfast option they are supposed to be. Thankfully, I’ve started to go easy on the sugar in green smoothies, and I’ve found they are still totally delicious! In fact, they may even be more delicious because you can actually taste the fruit flavors, instead of them just tasting like sweet, if that makes any sense? And you still don’t taste the spinach. Even without all that sugar. 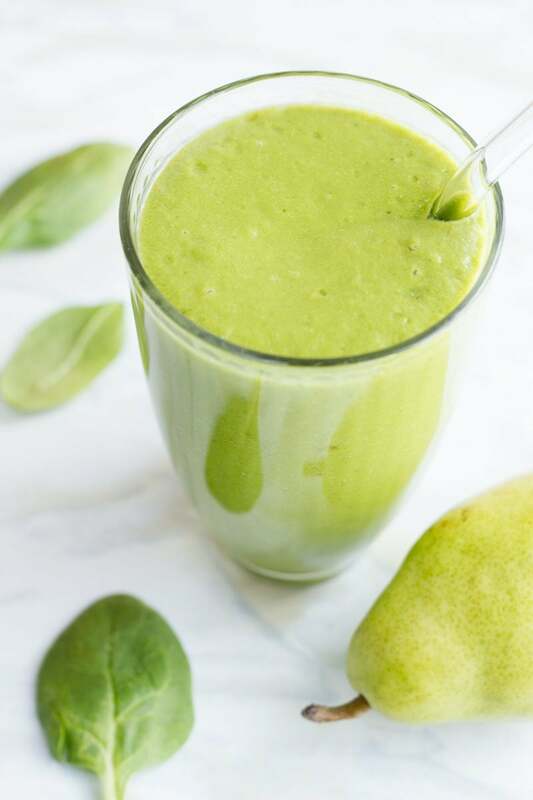 I used Medjool dates to sweeten this particular pear and spinach smoothie. To get the dates soft enough to blend into a smoothie, I soak them in boiling water for a few minutes, but if your dates are particularly soft (it can be hit or miss with the dates we get here) and you have a powerful blender (I love my Ninja Ultima! ), you might be able to skip that step. And hey, worse comes to worse, you have a few delicious chunks of date in your smoothie. 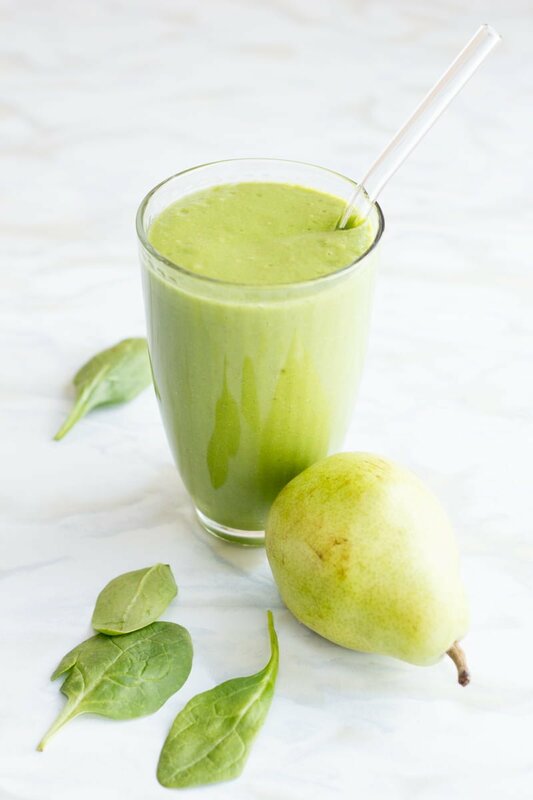 Worth noting, this pear and spinach smoothie is sweetened for my sugar-reconditioned tastebuds—to me, it tastes perfectly sweet, but to others it might be not sweet enough or even too sweet. Taste and adjust for your own preferences. 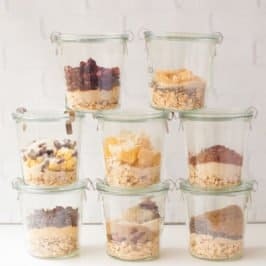 Place the dates in a heat-proof small container (I like a small glass measuring cup). Pour the boiling water over the dates and let soak for 5-10 minutes, or until the dates expand. Combine the dates and soaking water, plus all the remaining ingredients in the carafe of a high-powered blender. 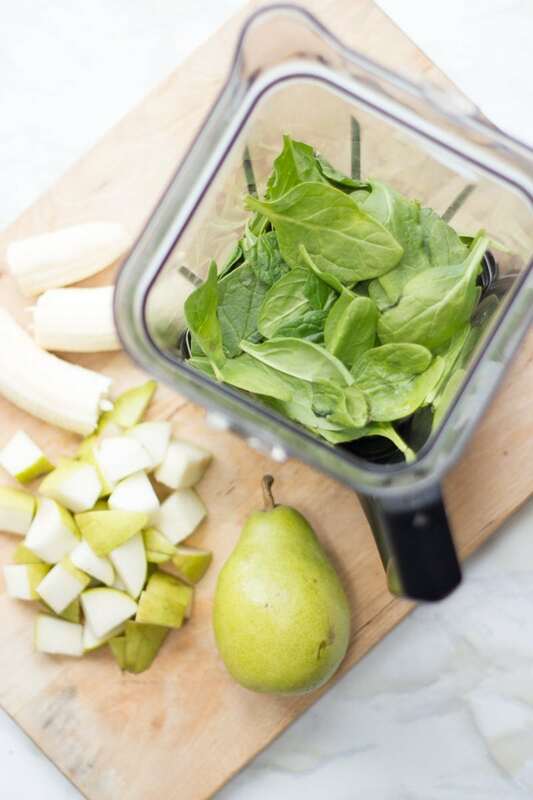 Blend on high until smooth and no chunks of dates or spinach remain. Pour into two glasses and serve. Use whatever milk you like (almond, cashew, soy, coconut, cow’s, goat’s, etc. 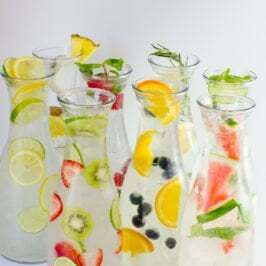 ), just make sure it is unsweetened and unflavored. I gave up sugar for Lent and have found it easier than I imagined it’d be. This smoothie looks great! 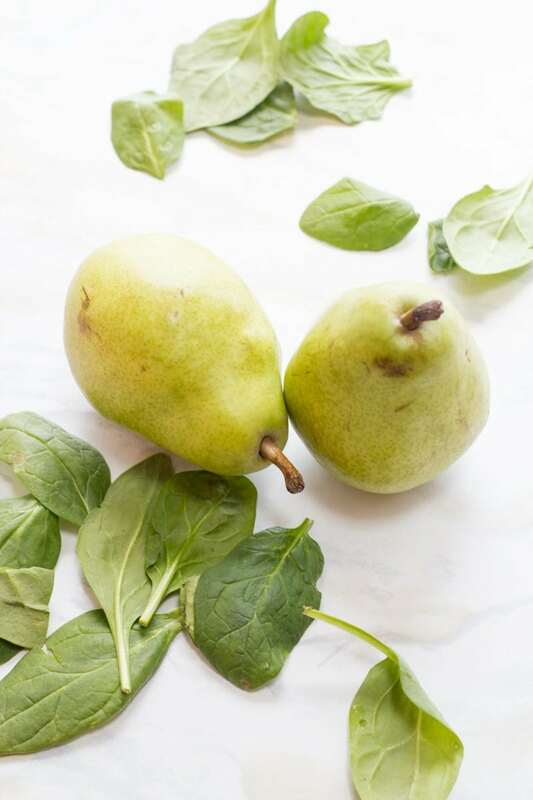 I’ve never tried pear+spinach so I’ll be excited to try this new-to-me combo. I am doing another round of no sugar right now too for the month of March. I’m not being nearly as strict this time around either in that I’m eating fruit and using honey and agave. But still always reading ingredient labels. Last week was rough! I’m not a restrictive person, not much is ever off limits and I’m lucky I like normal, healthy foods rather than junk and processed stuff, but i was missing my nighttime dessert. Or just grabbing a caramel or chocolate if I felt like it. I was so tired and it took me a couple days to realize why. Realized how much I’d been eating and while it wasn’t too crazy much I still was eating more than enough. I’ve kinda decided that maybe Friday nights and Saturdays can have some sweets but for the most part, I’m staying away from foods with sugars in the ingredient labels and desserts all the time. 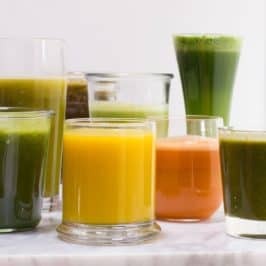 I once did a 14 day sugar cleanse that included not only added sugar but fruits/vegetables that were naturally high in sugar as well. By day 7 I was losing my mind. All I wanted was 10 pineapples, a bunch of bananas, and all the dates I could swallow. I felt like a drug addict haha. I can definitely relate. Now, when I eliminate sugar it’s in baked goods, white/brown sugar, etc but I keep honey, agave, and coconut nectar. Hey Cassie, great post! I am curious too about changing my tastebuds with added sugar. i dont know if i can completely give up sugar but i have found that the more i eat, the more i want..its like a drug for real. i am glad you are doing so well without it. im ready to start bringing smoothies into my life again. I gave up sugar too. I am even used to drinking coffee without sugar and for me that was the hardest. It is harder if you are thinking about sugar all the time, the secret is just totally forget about it. I’m gonna apologize in advance because I know I’m gonna ramble here, lol! 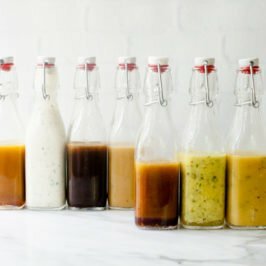 I am a menu planner, and like to stick to it as much as possible. For a mixture of snacks and lunches for school today, We were supposed to have yogurt topped with dates and pecans, egg salad with crackers, a fresh pear and a spinach salad. Well I realized as I went to bed last night that I forgot to buy yogurts. I woke up this morning with a fresh idea to use the dates in a smoothie, but I didnt have a clue what I would mix it with. Hello Pinterest, and Thank you Cassie. We kept the egg salad with crackers, and turned the pear, spinach, and dates into a delicious smoothie, I always have frozen bananas in the freezer, and I added the pecans that were supposed to top our yogurts, and I do have to admit, I piled the ingredients into the blender and then didnt blend them right away because my baby was still sleeping, Eventually hubby came around to blend it, and I noticed him squeezing honey into the top of the blender as it was blending, I quickly yelled at him, “thats enough” as he looked at me and said,, “oh sorry, it just looked kind of green”. I give my kids what we call green monster smoothies (literally just milk, bananas, and spinach) all the time, but I guess hubby was a bit scared of the monster this morning, lol! anyway, the whole family agreed it was delicious, and next time, I’ll try to blend it before hubby gets to it with some possibly unneeded honey. Hadn’t done the hot water with dates technique before and dang it helped them blend better and the smoothie seemed way more sweet-Naturally! So delish and, with what I can imagine, a healthy dose of fiber. Thanks! 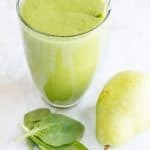 Loved this green smoothie it was delicious saving the 2nd glass for later in my fridge!!! !